This set of 5 marking cones will help you to mark out or outline areas within your gym or box. 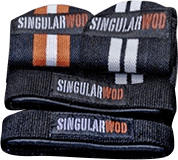 They are perfect for marking out areas during wods that include running or agility exercises. Made from flexible and resistant orange PVC. Format: Set of 5 units.